Try our Genuine Diamond Crystals Satisfaction Guarantee - compare our prices and our superior quality. Click on any natural diamond crystal image below to enlarge it. This natural cubic diamond crystal specimen is translucent with greenish-gray natural color in good condition overall. This natural diamond crystal weighs 5.14 carats! It is translucent to semi-transparent with cubic form and gray natural color, and it is in very good condition overall. This natural diamond specimen is actually two intergrown cubic diamond crystals with very rich greenish yellow natural color. These natural diamond crystals are translucent, and they are in very good condition overall. This natural intergrown diamond crystal specimen is semi-transparent with yellowish brown natural color. The diamond crystals have cubic form, and they are in very good condition. This natural diamond crystal weighs 6.84 carats! It is translucent to semi-transparent with a cubic shape. Its in very good condition overall, and it has grayish-yellowish-green natural color. Udachnay mine, Siberia ( Russia ). This natural, beautiful white diamond crystal has very good clarity and is still enbedded in the kimberlite host rock that brought it to the surface of the earth. The kimberlite has numerous eye visible olivine crystals throughout as well as other associated minerals. The size of the diamond crystal is approximately 7.0mm x 7.0mm and appears to be a twinned crystal. The overall size of the host rock is 35mm x 29mm, and weighs over 23.5 grams.The specimen was recovered at about the 500 meter depth of the Udachnay pipe, which is located 600 K M to the north from the city of Mirniy. We estimate the diamond crystal to weigh over 1.5 carats. The photo at left shows a cloes-up, see also a full-view photo. Found in Udachnay mine, Siberia ( Russia ). This natural, beautiful white diamond crystal has mostly good clarity and is still enbedded in the kimberlite host rock that brought it to the surface of the earth. 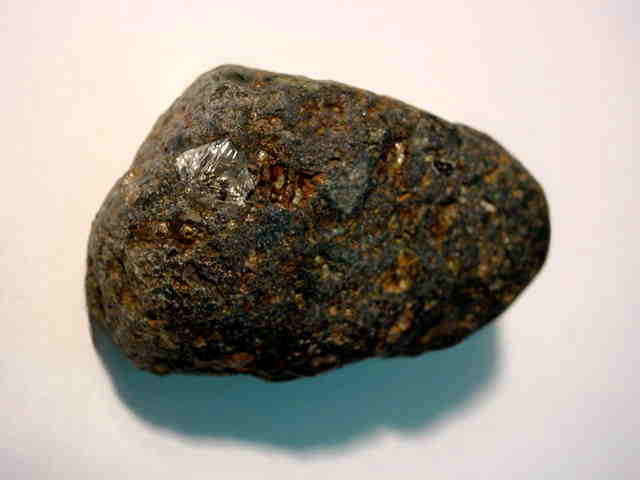 The kimberlite has numerous eye visible olivine crystals throughout as well as other associated minerals. 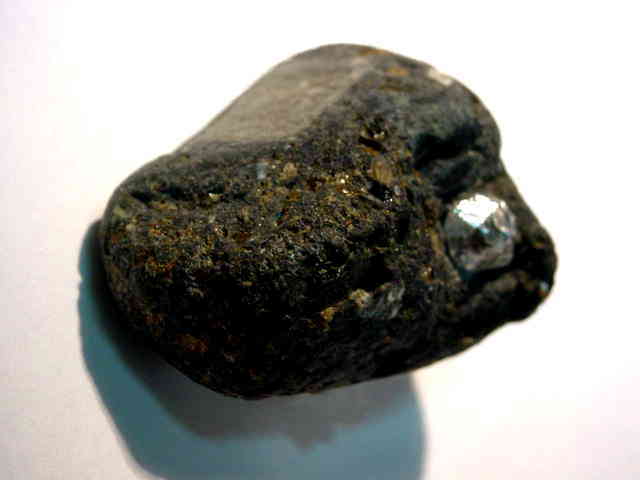 The size of the diamond crystal is approximately 6.8mm x 6.8mm and the overall size of the host rock is 45mm x 27mm, and weighs over 36 grams.The specimen was recovered at about the 500 meter depth of the Udachnay pipe, which is located 600 K M to the north from the city of Mirniy. We estimate the diamond crystal to weigh nearly 1.5 carats. The photo at left shows a close-up, see also a full-view photo. This is the end of our page displaying Natural Diamond Cubic Crystals & Natural Diamond Crystals in Kimberlite Matrix. See also our page displaying natural Fancy Color Diamonds. To see more genuine diamond photos, just select another item category from the table below. To see photos of another mineral variety, select any item category link in our Mineral Inventory & Factsheet Index. Would you like us to inform you when we add more Natural Loose Diamond Cubic Crystals & Diamond Crystals in Kimberlite Matrix on this page? We have a limited inventory of additional natural diamond crystals and diamond in matrix mineral specimens in stock, so be sure to let us know if you have any natural diamond crystal special requests. Please contact our webmaster or our 'site' geologist with any questions or comments. © Copyright 1998-2015 Gem & Mineral Miners, Inc.® All Rights Reserved.